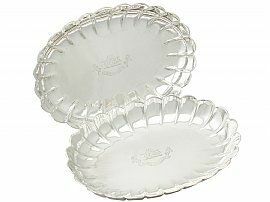 These exceptional antique Victorian English sterling silver fruit dishes have a plain rounded oval shaped form onto a plain oval collet foot. The embossed panelled bodies of these silver antique dishes are embellished with an incurved shaped rim. The surface of each dish is ornamented with an impressive contemporary bright cut engraved crest depicting a dolphin naiant pierced by an arrow fesswise, charged with a heraldic rose, all above the motto 'Gardez La Foi' - Keep Faith. The underside of each dish bears the retailer's mark 'Thomas, 153 New Bond St', in addition to the full hallmarks. These silver antique dishes are an exceptional gauge of silver, exceptional quality and in exceptional condition. Full hallmarks struck to the underside of each dish are very clear.